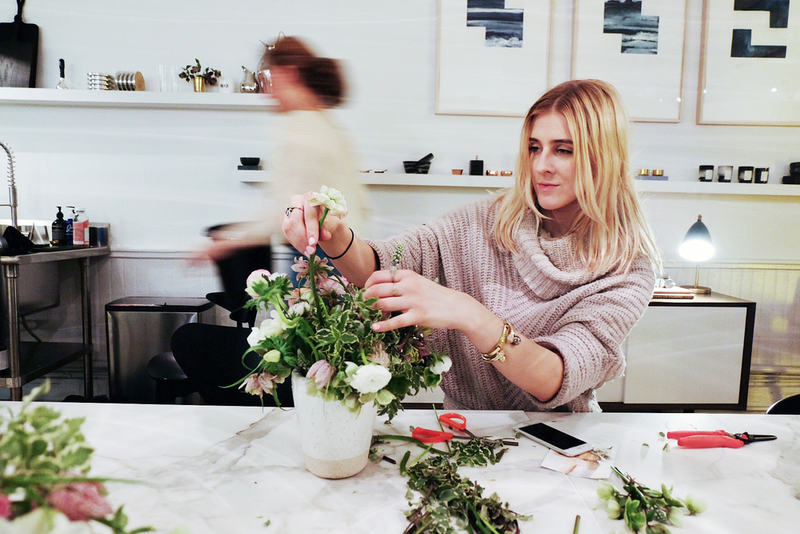 What better way to celebrate the arrival of Spring than by taking an interactive floral design workshop with the lovely, LA based fashion designer, Jenni Kayne. This evening class was held at my favorite curated hot spot, The Apartment By The Line NYC. New York based florist, Ariella Chezar, tag-teamed this workshop with Jenni in celebration of her floral-infused Spring 16 womenswear collection. The two of them made this a vibrant evening to remember. As I entered The Apartment which is a sunny, third floor Soho loft, I was greeted with eager eyes, urban spirits, and a beautiful spread by Nourish Kitchen. Different creatives with a willingness to learn and a relaxed energy filled the room. After a while of mingling and meeting new faces, it was time to #sipandsnip at the legendarily long, marble table that has occupied The Apartment since its opening. We took our seats, replenished our cocktails and were introduced to the wide variety of danish flowers presented like a buffet at the table. Among my favorites were the white ranunculus and anemone Marianne Panda. We sipped and snipped as Ariella lead the class. Below, I learned 5 golden tips to perfecting my green thumb. Lesson #1: Cut all stems asymmetrically. Be sure that as you build, there are no leaves that sit inside of the water - only stems allowed. This will ensure that bacteria does not grow and kill your arrangement prematurely. Lesson #2: Create the base and build your foundation. Take the vase and create 3 sections of stems like a balanced triangle. This will prevent any bald spots in the arrangement. Lesson #3: Choose a personal theme! I wanted my vase to look like unapologetic wildflowers... curated, of course. Choosing a personal theme first, allowed me to work efficiently and freely with a vision in mind and a style to look forward to. Lesson #4: Have fun! Smile along the way and do not get inside of your head. The beautiful thing about designing floral arrangements is that they can always be adjusted, restyled and replaced with different florals for the final outcome. 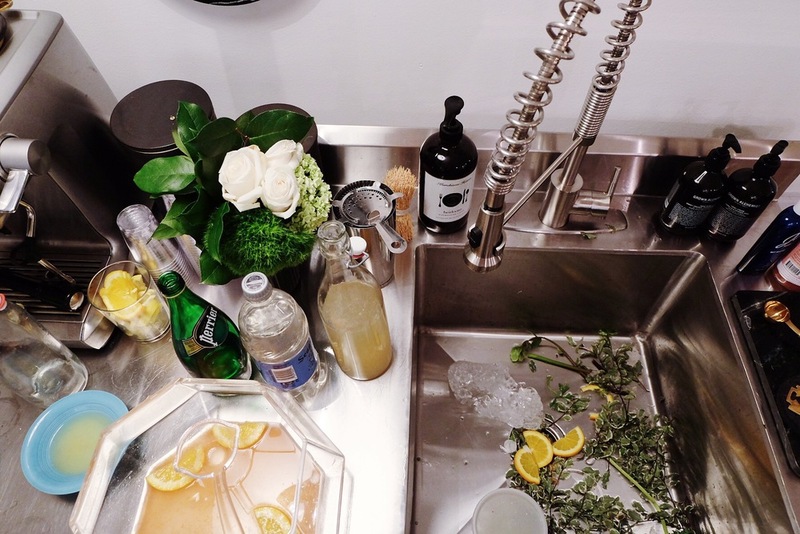 Lesson #5: When you place your arrangement in your home, be sure to keep a splash of non-chlorine bleach inside of the water to prevent bacteria growth. By the end, there were 20 unique floral bundles along the table, despite using the same selection of flowers! It was such a treat to see everyone's personalties come out through floral design. Some were bushy, some dangly, some short and stubby. Others had more greenery than flowers... Each set of blooms were gorgeous in their own way.